As Thanksgiving approaches, I remember with deep gratitude the month of November 2005. I had the honor of participating in a month-long online discussion on State of Fear with Michael Crichton through the Barnes & Noble website. Here are a few snippets of my conversations with him. May we have a sequel to Travels soon please? I find it interesting that NERF and ELF, the two sinister organizations, have acronyms that remind me of things from childhood: nerf balls and other nerf toys, and elf, one of Santa’s little helpers. It’s an amusing and ironic contrast. Michael, was that intentional? That never occurred to me while working! Interesting. I was aware that ELF was the same initials as an actual organization. And I was aware that the book SPHERE was at one time titled "ULF"---don't ask me why, I can't remember now. And there is a slang meaning for nerf, which is kind of hipster-childish, but not widely known, so I figured it would not influence most readers. But as for the similarities between the two...never crossed my mind. OMG! You wrote to me!!! Crichton commented numerous times during the discussion on a wide variety of topics. I never got to meet him in person, but I am still very thankful I had the opportunity to communicate with him in some manner. My favorite of all of Michael Crichton’s works is his autobiography Travels. (See the letter I wrote to him about it.) Travels was also Crichton’s favorite book. During an online discussion in 2005, Michael Crichton told me he was working on a sequel. I hope we get to read it someday. My favorite of his novels is Timeline. I love the combination of science and history. Plus Andre Marek is one of Crichton’s best characters. What are your favorite Michael Crichton books? Two years later, I read my father’s copy of the novel. And I've been hooked on Crichton's work every since. How did you discover Michael Crichton and what was the first book you read? Today would have been Michael Crichton’s 70th birthday. He died on Tuesday, November 4, 2008, the day of the last presidential election. Hearing about the upcoming election makes me feel sad, and not for any political reasons. It reminds me that we lost Michael Crichton. I’d love to know what the other 31 things were, and to see the card myself someday. To celebrate Michael Crichton, I’d like to come up with 70 words that describe and represent him. Unfortunately, I can’t come up with 70 words today, not if I want to do him justice. So I’ll just share one. What word comes to mind when I think of Michael Crichton? Crichton had the most stimulating mind I have ever encountered. 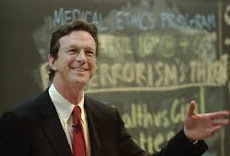 What word comes to mind when you think of Michael Crichton? On March 26 the Supreme Court threw out the U.S. Federal Circuit Court of Appeals 2011 decision upholding gene patents in the case Association for Molecular Pathology v. Myriad Genetics. The case was sent back to the lower court for a do-over, with instructions to review the case in consideration of the Supreme Court’s decision in the March 20 case Mayo Collaborative Services v. Prometheus Laboratories, Inc. Analysis, which held restrictions on genetic patents. On August 16, the Federal Circuit Court again upheld gene patents, with the vote going along the same 2-1 lines as in the 2011 decision. Now we’ll have to see if the case goes back to the Supreme Court. A new TV remake of the 1978 Crichton film Coma will air in two parts—Monday Sept. 3 (tonight) and Tuesday Sept. 4. Based on the novel by Robin Cook, Michael Crichton wrote the screenplay and directed the original film. In a March 2012 talk, book cover designer Chip Kidd shared his experience of designing the cover of Jurassic Park. Kidd also designed the covers for The Lost World, Rising Sun, Disclosure, Airframe, and Timeline. When 'The Lost World' (the 1997 sequel to "Jurassic Park") came out, I saw him at the book-release party and he posed for pictures with my family," Kidd said. "He was very gracious. And he was really tall. He seemed like he stepped out of his own TV show. He was literally larger than life, beyond smart and very good-looking. I’m so sorry I was away for so long. But I have a little treat that you may enjoy. I’ve been researching Michael Crichton for decades and this is the first I’ve heard of this nonfiction former work-in-progress. Crichton has mentioned other unrealized projects in his writings and interviews. I’ll work on compiling a list. Universal Pictures has slated a 3D re-release of Jurassic Park for July 19, 2013. Raise your hand if you’re looking forward to seeing the T-Rex in 3D. Though I think it’s good that the original film was not in 3D. Jurassic Park was scary enough in 2D. A friend of mine almost yanked her husband’s arm off the first time they saw the movie. Micro, the novel began by Michael Crichton and finished by Richard Preston, is coming out in paperback. The Trade Paper edition (the bigger paperback) will be released on April 25, 2012. The Mass Market edition (the smaller paperback) will be available on September 25, 2012. Such a shame. I made so many friends on that board over the years. Though it wasn't very busy as of late, it was a good resource for fans. (Thank God I've made a habit of downloading everything on the board--and website--for quite some time.) I can understand closing it down, but I can't understand deleting it. Many of the threads have valuable insights and links. Fortunately, the message board can be viewed in a web archive. Unfortunately, the most recent version is from July 2011 and so does not contain the recent posts about Micro. Here’s a treat: a photo of Michael Crichton in surgical scrubs on the set of The Andromeda Strain film. Crichton had a non-speaking role as a back-up surgeon in the film. On March 26, the US Supreme Court overruled a 2011 federal appeals court decision that upheld the legality of genetic patents held by Myriad Genetics Inc. The case is Association for Molecular Pathology v. Myriad Genetics. The Supreme Court threw out that decision, and sent the case back to the lower courts for rehearing. The high court said it sent the case back for rehearing because of its decision in another case last week saying that the laws of nature are unpatentable. That case, Mayo Collaborative Services v. Prometheus Laboratories, Inc. Analysis, was decided on March 20. Read the transcript of the oral arguments in the Prometheus case. A copy of Michael Crichton’s first published book Odds On is up for auction on eBay. Currently the price is $25 with one bid. Expect it to go higher than $100 by the end. (Only suckers bid early on eBay). Auction ends March 12, 2012 at 20:28:42 PDT. Seller’s reputation is 100 percent positive. Odds On by John Lange aka Michael Crichton. This is very readable copy of Michael Crichton's first book originally published in December 1966 by Signet under his pseudonym John Lange. This is a third printing in acceptable condition. Other Signet Titles by John Lange listed on page 2 of this book include Scratch One, Easy Go, Zero Cool, Drug of Choice and Grave Descend, which means this copy was most likely printed about 1970 when the last two books listed were first published. Richard Preston was so captivated by Michael Crichton's The Andromeda Strain he feigned illness so he could stay home from school to finish reading the book. "I was trying to figure out how to make all the blood in my body clot up like it did in the book, but that didn't really work with my mother," Preston (pictured above) says. "So I faked coughing instead." A transcript is now available for the Nov. 27 NPR interview with Preston. On his Facebook page, Preston has been posting some photos of Hawaii that inspired some of the descriptions in Micro. Check it out! There’s a fantastic radio interview of Richard Preston on Some Books Considered. The Jan. 9 program is quite informative about the process of writing Micro. Sorry for the long silence. My productivity has been temporarily impeded by my working in retail during the holiday season, and recently by a slightly strained shoulder. Be back soon…. In the meantime, here's something on Ebay that I really wanted. A book that had belonged to Michael Crichton. His name is written in it. There are underlined passages, and notes in the margins. (See the photos) Somebody else got it for the Buy-it-now price of $350. Killed me not to be able to buy it.